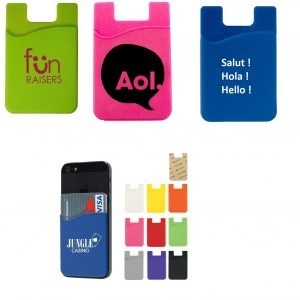 There are currently many kinds and many colours cardholders for your mobile phones and smartphones. Cardholders with or without standard, with or without sticky back. But did you know we can make the cardholders in any pantone colour? 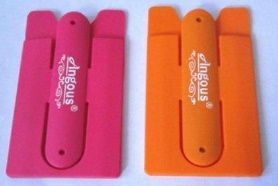 Then you have your cardholders in your preferred style colours. The cardholder of this moment is the silicone cardholder with standard: these cardholders are made of silicone so they stay nice for a long time and have a good durability. The fun thing about these cardholders is is that there is a standard on it, and when you press the middle it will pop out. You can use it to watch videos and when you’re done you just press it in again and you can go on your way. And… We can print a logo or text on this bendable piece. Because of this you can make this silicone cardholder very original and a great promotional gift that your clients will use for a long time. Every time your clients grab their phone they’ll see the logo and think of you. A small investment, a huge result! 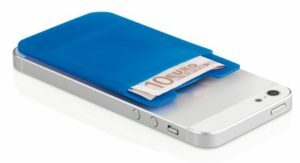 The silicone cardholder has a sticky back so you can easily attach it to the backside of your phone. This way you can easily take your credit card, ID, etc. with you. You can order this cardholder for mobile phones with a starting amount of 300 pieces in the colours: Yellow, red, white, green, blue and pink, with or without print. We can print your logo or text on the clip. The higher the amount, the lower the price per piece! Next to the silicone cardholder with standard, there are also cardholders without standard! These are a bit cheaper because they don’t have a standard. These cardholders are easy to attach to your phone because they have small suction cups. So also easy to remove! They’re made of nice, flexible silicone. You can keep your cards or money in it. The size is ca. 5,5 x 9 cm. We can print the cardholder with logo or text. You can order these cardholders with a starting amount of 300 pieces, in the colours blue, white, red, black and yellow with or without print. Next to this model, we also got nice silicone cardholders with sticky back. These holders have a funny shape. The size is ca. 8,5 x 5,5 cm. We can print your logo or text on these cardholders, in 1 or more colours.